"Next time you see me, it won't be as friends." This could be attributed to anyone at any time. Alliances and loyalties are constantly being tested and the future seems to become more uncertain by hour. Arguably, the most important change is who will be the next grounder commander. I've been foaming at the mouth to see how this conclave business works ever since Lexa mentioned it back when she and Clarke hung out in King Kong's cage. I finally got my wish... for the most part. Other than slicing a hole in the back of the new Heda's neck and throwing the chip in, we still don't know what the ritual entails. So that's how the new commander gets chosen? Little kids are encouraged to murder each other and (inevitably) the most sadistic wins control of entire armies? I'm starting to understand how that blood must have blood mentality survived for so long. Sheesh. I feel a little robbed that we didn't get to know Aden a little longer. I really didn't expect him to die, and kudos to whoever decided to leave the mini decapitated heads out of frame. Knowing was enough. I feel like Titus and Pike are kindred spirits. They are both so dedicated and loyal to who/what they serve, and both only take actions that they believe are righteous. And they are both responsible for catastrophic errors in judgement. Titus killing Lexa was the equivalent of throwing everyone's future into a bag, giving it a good shake and pouring it all back on the table to see what sticks. He knows the uncertainty that he's put the clans in, and it took a serious toll on him. I don't think he was planning to live much longer after handing over the flame and title to Clarke, and I admit I got a little kick out of seeing him stick it to Ontari. Pike offered Lincoln the tiniest amount of peace for giving himself up by promising to care for the other prisoners. Short of, you know, calling off the whole bullet-in-the-head plan, it was the kindest thing he could do for him. So he isn't evil. He isn't irredeemable. Will be see his mistakes before it's too late? Pulling Luna out of thin air might be a little lazy, but Ontari seems like a nightmare so I'm not mad about it at all. But with no Lincoln, no Google maps and Ontari already poised to lie about being ascended, how much of a difference could she make? Here's hoping Luna has a thing for blonds. Clarke's luck seems to be wearing a little thin lately. Brian (Miller's boyfriend) decided to join team Kane. As did Bellamy and Monty. Monty even had to make moves to keep his friends safe in front of his mother, and then she chose to lie to Pike to cover for her son. Lots of shifting loyalties this week. And with Aden, the other nightbloods, Titus and Lincoln biting the dust, there was a lot of death too. All in all, this was a strong start to the rest of the third season. Is Jaha still in Arkadia? I imagine him sitting back watching all the execution shenanigans and bragging that he doesn't have to deal with such matters in the City of Light. A side note, I was searching for pictures of Ontari and randomly a picture of Calisto from Xena popped up. This does not bode well. Wide angled shots of Arkadia showed how run down the camp has become. Hello, symbolism. Plus Pike, the guards and Lincoln were literally standing in murky water during the execution. I enjoyed that Bellamy didn't get to play a hand in the rescue mission. I'm glad he is finally seeing the light, but Octavia was right. He backed the wrong horse. Kids killing kids smacks of The Hunger Games. Is it possible that Lexa didn't allow Titus to go after Luna when she ran away because the A.I. knew that a hidden spare nightblood would be needed one day? Roan and Titus both went out of their ways trying to help Clarke escape to make good on promises/old debts to Lexa. Honorable. Abby and Kane are too cute. How great would it have been if Clarke had her fiery red locks when she became the new flame keeper? Murphy has serious survival instincts. Ontari had a reason to kill him and it looks like he talked her out of it with one sentence. Harper: "Does your mom know you're here?" 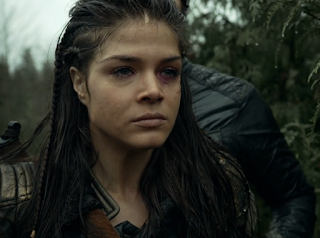 Octavia: "You're the reason they need saving." RIP. Just look at the flowers, Lincoln. Yeah, Corona. Me, too. I liked Lincoln. Kane and Abby. About time. Although if it were me, after all the things he did, never! No matter *how* much he resembles Desmond! I know you're not a Murphy fan, Laure, but I loved him in this episode. He kept saying what the audience would say to Clarke if they could, and he made me smile every time. Meh is for Bellamy. He has turned into a really pathetic version of himself, even by season one standards. What I fear is that the writers have no clue about how far they’ve taken him. He mass murdered a friendly army and now his actions have led to Lincoln’s death as well. 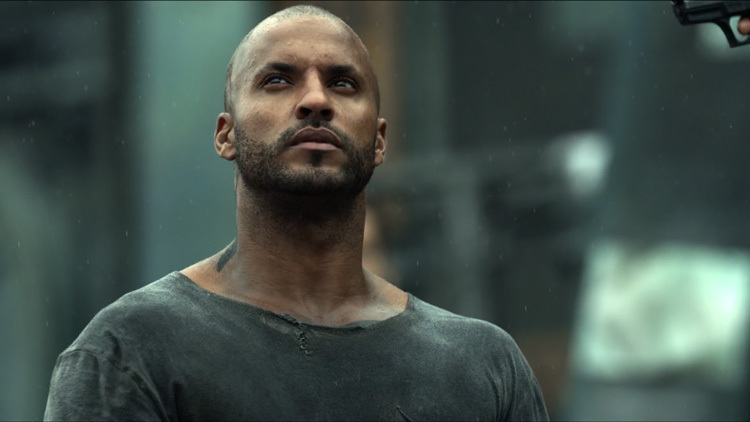 Ricky Whittle said on an interview that Lincoln was only supposed to die on the season finale. Then an amendment on the script of this episode, which originally ended with everyone escaping safely, had Lincoln killed off on it. That makes me wonder: did the writers factor Lincoln’s death on how we would perceive Bellamy when they originally conceived Bellamy’s arc? I don’t think so. Meh is also for Pike. His actions were similar to a child’s whose toys were taken away. “I’ll kill somebody today. Don’t you there try to stop me. I’ll find some toys to kill.” I’ll give this episode some credit, though: Pike is mostly a one note character and his actions have very little logic sustaining them, but he did take his villainy to another level when he killed Lincoln and now I do respect him on an emotional level. So there is that. That final moment with an enraged Octavia looking at Pike post Lincoln assassination. Wow is for the episode as a whole, which was pretty good. There was that usual rushing through the story (I wish The 100 had a longer episode order to give some developments more room to breathe, even if that took away the breakneck pace from some of the episodes), but I was impressed with the overall result. For example, it is sort of a cheat that we didn’t get to see The Conclave as it traditionally goes down, but the premature slaughter of the children was a bold move and it quickly established Ontari as a villain to pay attention to. On the other hand, Ontari was kind of dumb not to realize that Murphy had nothing to do with the ritual, and that cracked me up for some reason. Maybe it’s the actor, whose line deliveries are gold. Also gold? Octavia. Girl is resourceful, and I absolutely LOVED when she poked Kane about living hidden for sixteen years. The final moments of the episode were very powerful, and Marie Avgeropoulos nailed it, especially that transition from devastated to vengeful. She is so jus-drein-jus-dauning Pike. Good development on Miller and Brian’s relationship. Although most of the time the actor who plays Miller acts as if Brian is his macho bro, he’s slowly getting more comfortable playing their scenes and I loved his little smile to Brian when Brian opened his eyes after the fake out. Abby choosing to stay clarified why she was not involved on the uprising of the previous episode: she couldn’t go to jail nor be forced to escape because she is the protagonist on the A.L.I.E. subplot and the writers need her at Arkadia. They could’ve at least come up with a reason for her not showing up at all last episode. But, who cares, she totally kissed Kane, which was very much earned and I’m so glad for those two. They better meet again. This Week on Pike is Not the Brightest Leader From the Sky: Right after our group of protagonists sans Lincoln escapes, Pike proceeds to kill Lincoln outside. He didn’t consider that he could be shot and killed by the “traitors”? And he didn’t torture information out of Lincoln to capture the others quickly? YES! FINALLY! It does feel like she’s been in there forever. I know she’s not the driving force of the story as she used to be, but I have missed her interactions with her people so much. Last but not least, rest in peace, Lincoln. I’m sad he got underused this season, but his death was very well done. He died a hero and he’ll remain a hero on the heart of his beloved ones. Lincoln was the intersection of the grounders and the arkers, the proof that those two groups of people can live at peace. He saw on the Sky People (at least on some of them) the possibility of a less violent society and that’s why he was willing to be a part of them. His final words were the Sky People’s most famous saying, spoken in Trikru language. His heart was with the Sky People but he also never let go of his origins and of taking care of his people. I think there’s a huge symbolism on Pike killing Lincoln. While Lincoln is the intersection, Pike is the purist, extremist and intolerant. He can’t see a world where there is no war against the grounders. And so, intolerance kills the intersection and worlds remain divided. One can only hope that’s not a prelude to what’s to come on the bigger picture of the series (and the world). At least Lincoln's death did fit in this part of the storyline and gave some personal weight to the entire Pike mess. Now we hate him for real not only for ruining Bellamy's character. 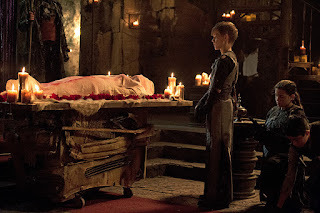 Too bad we did not see the whole ritual, but I guess Clarke will perform it later in the season. I wonder if the heightened Skaikru resistance to radiation compared to Grounders (as proven by mt. Weather experiments) and susceptability to A.L.I.E. chips means that Titus was wrong about the need for black blood in the ascension process. I would prefer to see Clarke as the new commander instead of a previously unseen character.